Mind Body Eating changed my life, and it could change yours too. If you struggle with binge eating, emotional eating, or negative body image – you have to watch this video below! > What is Mind Body Eating? > And my new online course all about Mind Body Eating! I believe that the thoughts we entertain are just as important as the food we decide to eat. The eating experience affects your digestion, metabolism, and assimilation of food – not just the type of food! Mind Body Eating is a new approach to health coaching that encompases the entire being – mind, body and spirit. Nutritional facts are great, but as a Coach I’m even more interested in your story, what’s happened in your life, how did you get to where you are today, and what are some small actionable baby steps you can start making to live the life that you desire. There is a deeper meaning behind your eating challenges. Mind Body Eating is a doorway into your higher consciousness and evolution. It will allow you to go “ah ha” or “oooo that makes sense” and “wow, I never thought of it that way!” I’m here not only to help you up-level your health and nutrition, but your thought processes, your physical environment, your friend group, your career, and overall contentment and happiness. The online course is currently being built as I write this! So exciting! This will be a great step to take if my Private Coaching is off your radar. I recommend the Mind Body Eating online course to anyone who has struggled with binge eating, emotional eating, negative body image, and/or overexercising. I specifically believe I can relate to the young woman who desperately wants to feel like herself again. I personally love courses that provide audio that I can take with me on the road, or listen to whenever needed; so that’s how the online course is being designed. I’m a Mind Body Eating Coach certified under the Institute for Psychology of Eating in Boulder, Colorado. I’m also a yoga teacher, lifestyle & career coach, and online wellness advocate. To be added onto my email list and waitlist for the Mind Body Eating online course, Subscribe Here! Go to the “Mind Body Eating” Tab above on the Menu for more free info and trainings! These days I try to not overexercise. I only do exercise that feels good to me. It’s not about burning the most calories possible, to me. It’s not about killing myself in the gym, or doing anything that feels more like torture than pure joy of moving my body. I got on my bike for the first time this season! I literally had to hose spray the dust off of it from winter. I went with one of my long time clients who bikes regularly, and she just rocks it every time. I love going with her because it’s more about conversation and enjoying the weather and just feeling really good while moving! But if I’m going to be completely honest, I probably road a little too far. We went 20 miles, which to some is like nothing and to others is like a lot… and it felt really good while we were doing it, but the last probably 5 miles it started to not be as fun anymore. But we both really wanted “that 20 mile marker”! And by this point it was 7:30pm and I hadn’t eaten since my smoothie and I was pretty ravenous and so I ate the Sloppy Elk Burger with all the Sourdough bun and all the tater tots and all the snap peas. I ate too quickly, in a stressed state, which I know caused me to shut down digestion and made the food sit in my stomach. And all the sudden I had a flashback to when I was training for my first sprint triathlon, and I was over exercising, and it would almost ALWAYS lead to overeating and made me feel terrible about myself. Like I was a hamster just stuck in a wheel trying to lose weight, be healthy, feel good, but I was trying way way way too hard and doing way too many things including eating too much. Sure enough my stomach started to feel better and I was able to fall asleep. The next day was the next day! There was nothing to morn over and there’s no way I’d ever “skip breakfast” (totally something I would have done in the past) because I ate more the night before than I usually did. No, now I just have a lighter breakfast and check in with what I need to start my day feeling really good. I think I had a different smoothie recipe that morning. ​​​​​​​I know this is a long story, but if you’ve made it this far you can probably relate. Exercising a ton doesn’t mean you’re going to lose weight. If you feel like you are caught in this cycle right now where you are over-training, over-exercising, over-competitive, over-perfectionistic, over-doing-everything — and you’re over-eating. I strongly encourage you to back off, just as an experiment, to see what happens. Notice how it feels, and see if you feel better! Laying in my bed doing absolutely nothing but breathing and saying nice things to myself was the best I felt all day. I wanted to cry because it felt so good to slow down, breathe, get back into my body, and reconnect. Try this or something like it next time you catch yourself in a frenzy of over-doing. I love you for reading my story! I hope you found it helpful or at least relate-able. I’m teaching a Live Mindful Movement video in my private facebook group around 3:30pm MTN! Most of you are already in the group, but if you’re not you can join us here. I’ve already had some suggestions to add my resistance bands and to do Yoga Sculpt (which is yoga with dumbbell weights) so it should be a great workout. I’ll see you later today in Mindful Movement w/ Macy! The new private facebook group that HY offers for free, quick, effective, fun, at-home “workouts”. I’m really enjoying Mindful Movement w/ Macy to connect with my students from allll over, and provide some freebie content for everyone that supports me and wants to be more involved in what Hungryoga is all about. So what is Hungryoga all about? 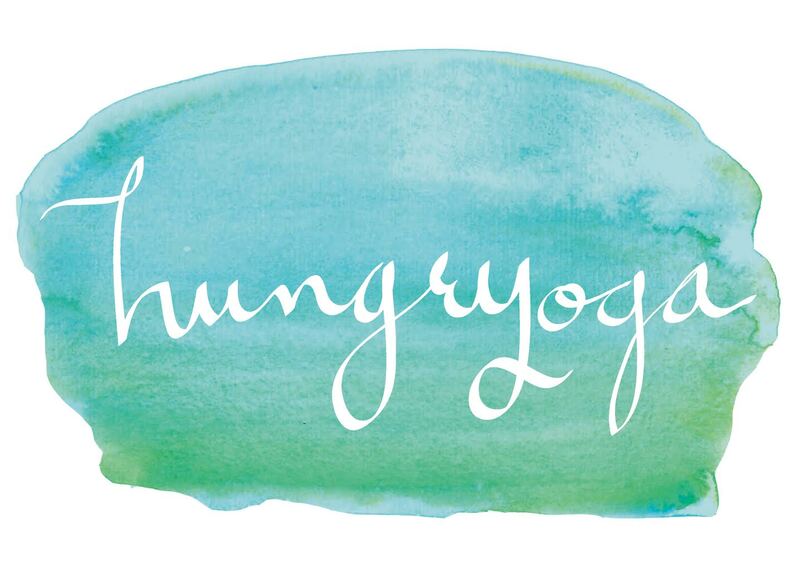 Hungryoga is the union of mindful movement, eating psychology, and living life by design. Mindful Movement is the first step. For way too long, I was using exercise as punishment. I had the mentality, “no pain, no gain” and the only thing I was gaining… was weight. Did you know that overexercising, too much cardio, and high intensity working out – can actually cause you to gain weight? But so true. When our body is in a constant state of Stress, we tend to hold onto weight to protect us. That’s why it is my PASSION to provide people with Mindful Movement. To do things that actually feel good. Give you more energy. Leave you feeling better. More integrated. Connected. And Confident. In Mindful Movement w/ Macy I share short, fun, and laid back Pilates, Yoga, & Strength Training videos. I will also hop on and just connect with you. This group is completely free, but I will talk about upcoming courses, workshops, and other offers online so members of the private group will know about my offers first. My goal and intention with this group is to give a lot of value, help people love themselves again and realize that exercise can feel good again. You can purchase the ones I use below. Love them! Hello everyone, it’s Macy here from Hungryoga and I’m excited to share this interview with Pierre Couvillion about his life & more on the Yoga Ayurveda Colorado Retreat. Pierre is offering a Yoga Ayurveda Colorado Retreat here in Littleton, Colorado on October 7th & 8th at Ascent Therapy Clinic. This is where I teach private yoga and semi-private yoga, pilates and strength classes. We are so thrilled to help Pierre host this Retreat and bring his knowledge and wisdom to Littleton. Pierre is triple certified in yoga at the 500hr, is an Ayurveda Practitioner, & Massage Therapist. He owns Santosha Yoga School in Indianapolis, and teaches retreats all across the globe. I hope that this interview will give you a deeper connection to Pierre and all that he has to offer. Without further anticipation, here’s Pierre! – Details on the Yoga Ayurveda Colorado Retreat coming up in October. What’s all going to be offered at this retreat? How is it going to benefit the students that decide to commit to this experience? Who would you say this retreat was designed for? Is it for beginners to yoga, yoga teachers, or both? What type of transformation do you expect your students to have walking away from this retreat? – Where to find more details on the retreat, and how to sign-up. Thank you everyone for listening! We hope to see you in October at the Yoga Ayurveda Colorado Retreat in Littleton, Colorado. Sign-Up for The Yoga + Ayurveda Colorado Retreat! ‘Cowboy Caviar’ aka ‘Nommy Dip’ Video Recipe! NOMMY DIP IS SO GOOD!! Especially in the summertime, it’s so refreshing! I have heard this called ‘Texas Caviar’ or ‘Cowboy Caviar’ but all I do is go NOM NOM NOM when I’m eating this, so that’s why I called it Nommy Dip! I’ve made several variations of this dip, but I love this one because of all the fresh ingredients and it has stayed good in my fridge for a week now.. and there’s avocado in it! I made a different variation of Nommy Dip a few weeks ago at a pot luck, and everyone raved about it! Including me… I’ve been making homemade breakfast burritos too, and the Nommy Dip is great to use as a salsa! Something that the girls K&K at Tone It Up taught me was that you can use bell peppers, cucumbers, zucchini – really any veggie that you can form into a chip for your dip! I’m a sucker for tortilla chips and any kind of salsa, but I love using veggies as chips too – for all dips! So here’s the ingredients for the hipster Cowboy Caviar… Nommy Dip! – Favorite Chips: Tortilla chips, blue corn chips, and black bean chips are all delicious with Nommy Dip! Follow along with the video to make Nommy Dip & ENJOY!! 2. Pick & Chop Cilantro – act like your picking flowers petals off a stem, and then chop ’em up! 4. Squeeze 2 limes, marinate with Italian dressing & add your favorite spices! 5. Enjoy right away or store in fridge up to 7 days! I hope you liked this Nommy Dip Recipe! Please leave a comment and let me know if you made it, or maybe came up with your own fancy variation of Nommy Dip aka Cowboy Caviar. For more recipes like this you can follow @hungryoga on Instagram and check out our “Story”. Before you go, I do have a question to ask just because I’m curious! – Do you believe that decreasing our consumption of meat can help conserve the planet, and improve our overall health?